January 03, 2018 at 11:36 am. Buffalo Bills running back LeSean McCoy is considered “day-to-day” with a sprained ankle, coach Sean McDermott announced Wednesday. McDermott offered little else on McCoy as the Bills prepare to play against the host Jacksonville Jaguars in Sunday’s wild-card game (1 p.m. ET). The postseason contest is Buffalo’s first since 1999. McCoy will not practice on Wednesday, three days after being carted off the field with a right ankle injury following a tackle by linebacker Chase Allen in the third quarter of the Bills’ 22-16 win over the Miami Dolphins. The 29-year-old McCoy immediately took off his helmet and was pounding the turf following the injury. McCoy rushed 287 times for 1,138 yards and six touchdowns this season, with quarterback Tyrod Taylor ranking second on the team in most rushing statistics. 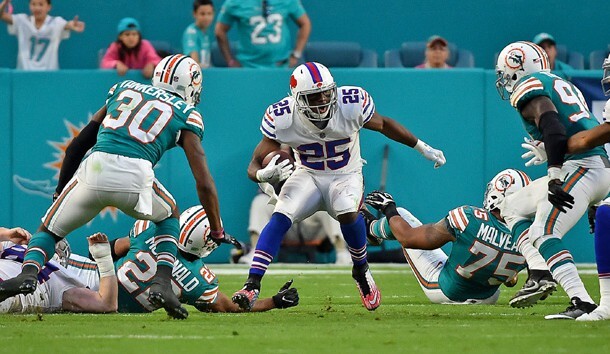 Overall, McCoy’s 1,586 yards from scrimmage represent 33 percent of the team’s total. Mike Tolbert rushed seven times for 39 yards while Marcus Murphy had seven carries for 41 yards versus the Dolphins. Fullback Patrick DiMarco is also on the roster. He appeared in every game this season but only rushed for two yards.